I stayed in Ridge #1 lwith my family and had a wonderful time. We love the ski-in ski-out access, the privacy, and the absolute care that they take to make our stay comfortable. In fact, last year when the power went down around town and we had no early morning coffee... until the manager Matt Tate came to our doorstep at 8 am with four piping hot cups of coffee. I love this place! The property was great. Couldnt have done it without Mighty Mouse Management. They truly are one of a kind. The property is unbelievable and perfect for any large family rental. 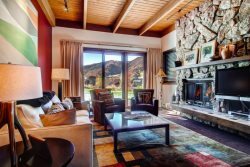 I dont think I could have asked for a better stay in Snowmass.